COLUMBUS, OHIO – The Columbus Blue Jackets have signed forward Jake Hansen to a standard two-year entry level contract, club Executive Vice President and General Manager Scott Howson announced April 12. Hansen, 22, just completed his senior season at the University of Minnesota (WCHA), where he registered 16 goals and 22 assists for 38 points, 58 penalty minutes and a +19 plus/minus rating in 43 games. He set career highs in goals, assists, points, plus/minus rating, penalty minutes and games played, while helping the Gophers reach the Frozen Four. A native of St. Paul, Minnesota, Hansen was the Blue Jackets' fourth pick, 68th overall, in the 2007 Entry Draft. In four seasons with Minnesota from 2008-12, he tallied 36-41-77, 165 penalty minutes and had a cumulative plus/minus rating of +11 in 149 career games. 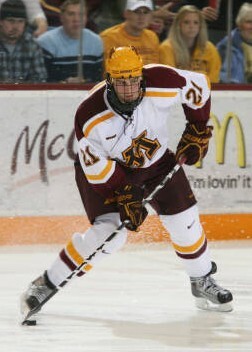 He was named to the WCHA All-Academic Team in 2009-10. Prior to his collegiate career, he notched 35-31-66, 71 penalty minutes and was + 15 in 75 games with Sioux Falls (United States Hockey League).